As medical device professionals, we share a common goal of producing safe and effective medical devices that meet all mandated compliance regulations and can be quickly brought to market. Nearly 20% of employees spend their time seeking internal information while at work, according to a report published by McKinsey Global Institute. The good news is, more and more medical device companies are beginning to adopt automated quality systems to better manage the control of documents within their QMS, saving time and reducing risk. The bad news being, many companies still have a long way to go as they continue to rely on paper-based systems to manage this process. Whether you're in the midst of product development and considering alternative solutions for your quality system document controls, or you're interested in implementing a more robust system that addresses multiple functions within your QMS, it's important to understand the role of document controls within a quality system. Only then will you be able to properly implement the right procedures unique to your product development. 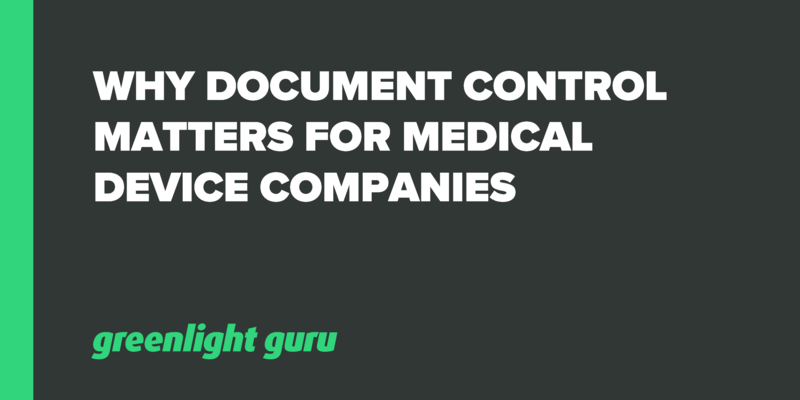 Note: Greenlight Guru offers a turnkey document control solution specifically for medical device companies. Click here to learn more. The quality system requirements laid out in 21 CFR Part 820 are intended to help companies develop safe and effective medical devices which will ultimately benefit the patients who use them. The requirements found in Part 820 translate into dozens of policies and procedures that cover everything from environmental regulations specific to manufacturing facilities, to statistical techniques used to control processes and products. In addition, companies are expected to maintain documented records of product design reviews, customer complaints, verification and validation testing, training, and the list goes on. Due to the variation and sheer volume of records teams create during product development, the documentation method you choose should have comprehensive capabilities. A formal documentation system that satisfies these basic capabilities will help tremendously with menial tasks and processes that must be completed for regulatory compliance. Are Document Controls Required By US Law? Medical device manufacturers operating and selling products in the United States are required by law to have formalized procedures of their document controls. The U.S. governing agency, Food and Drug Administration (FDA) provides all regulation guidelines pertaining to document controls free to the public, which can be found in CFR Part 820 under Subpart D.
FDA guidelines for document controls require medical device companies to assign a designated individual within their organization to review and approve all documents. This person is also responsible for managing any changes made to these documents. In such case, any changes must be documented by that same designated individual with a description of the change, approval signature(s), the date of the change, and when the change is meant to go into effect. Any obsolete documents must be made inaccessible to prevent unintended use. If a company is undergoing an FDA inspection and it’s uncovered that the organization failed to adhere to the requirements of document controls, the company could face 483 observations and warning letters, as well as subsequent delays in bringing their device to market. Are Document Controls Required For ISO 13485:2016 Certification? Medical device companies looking to access international markets can do so by attaining ISO 13485:2016 compliance certification. This certificate demonstrates a medical device company has successfully established documented procedures within their quality system that meets ISO standards. The overlap in requirements between both regulatory bodies can serve to be an advantage for some manufacturers who have products across multiple markets. By establishing a single procedure for document that satisfies both FDA and ISO standards, you can achieve the compliance needed to sell into both of those markets. Many device companies today still manage documents using paper-based systems. Using a manual process to manage all design, development, and quality records not only creates unnecessary risks to the quality of the device being developed, it also poses legal risks to the company manufacturing the device. There’s a growing trend of companies taking a proactive approach to managing their document controls through the use of automation. Compared to manual systems, companies that take this progressive approach to control this important process can experience huge gains above the competition, saving time and money, and ultimately allowing for safer devices to go to market faster. Electronic document controls ensure that documents are always accessible in their most current versions. When the FDA or ISO audits your company for compliance with the corresponding requirements, they may quickly access any and all documents that are relevant to the audit, lessening the risk of compliance issues due to missing documentation and ensuring that audits are finished quickly, with minimal interruption to your daily operations. Paper file systems are notorious for generating lost documents, and it's a fact that 25% of lost documents will never be recovered. Document control software saves space in your office by eliminating the need for robust filing systems and ensures that no document is ever lost in transit, a common occurrence which invariably leads to difficulties when auditors arrive. Software systems streamline processes like document approval, allowing the relevant parties to put their virtual stamp of approval on any newly added or modified document in the QMS from a company-authorized laptop. Additionally, your staff will never need to search filing cabinets for documentation they need - it's all stored securely in your QMS and available from their computers. In a competitive industry, it's crucial that your data is kept safe from folks that might want to garner insight into the processes and procedures that are making you successful. Document control software protects your files by limiting access to authorized personnel only. Cloud storage ensures that your valuable proprietary documents are protected from anything - they won't be lost in a data center mishap, nor by flood, nor fire. 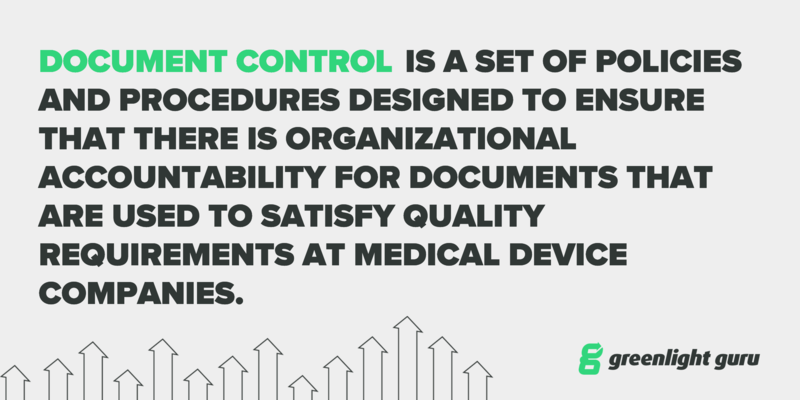 One of the most effective ways a medical device company can establish and maintain a healthy quality system is by implementing an automated solution to carry out their document control procedures. Having the ability to manage all records with a purpose-built system is a foolproof way to ensure control of your documentation and that everything is kept organized, accessible, and up-to-date. The more robust and usable the system is to manage these foundational procedures, the more it will help the company move safer, higher-quality products to market. Our Advanced Document Management software, specifically designed for medical device companies, is an automated turnkey solution designed to help development teams collaborate more efficiently, improve audit readiness and securely store and manage all documentation. By implementing a system that prioritizes product development procedures, unnecessary costs can be eliminated, manual work can be reduced and overall business risk can be mitigated.